Jack Indusa is logistics officer, CVT Nairobi. I first went to Kakuma refugee camp last year when we began to set up a new CVT center there. I had the chance to meet some of the people in the community – people were eager for us to get started bringing mental health care and physiotherapy to the camp. Kakuma is located in Turukana County, in the northwestern part of Kenya. Setting up a new center takes a lot of coordination of multiple efforts for setting up everything from vehicles, buildings, electricity, water and, most importantly, helping the people get settled in to work. We start from the basics, and it’s my job to keep everything running. I’ve been working in logistics for many years, working at other non-governmental organizations (NGOs) and commercial businesses as well. I was with a refugee agency, where I fell in love with the humanitarian aspect of the work – I felt more fulfilled doing humanitarian work than commercial work. So when I saw that a logistics position was open at CVT, I was interested. I liked the saying I saw on CVT materials: Restoring the Dignity of the Human Spirit. I appreciated that CVT was helping people move forward with their lives. And though I’m not impacting clients directly, my work helps the staff to meet their goals. The most important thing in my job is providing a seamless flow of staff activities, and I always have to find solutions quickly. For example, when we were setting up the new center in the Kakuma camp, we had to get supplies from Nairobi up to Kakuma as we were preparing the site. I had to make sure the vehicles were serviced and in good enough condition for the long-awaited drive on the road. It’s a two day trip from Nairobi, more than 800 km. And it is not an easy drive – the road was treacherous. From Nairobi, we transported cars and supplies to facilitate the program, things like stationery, office equipment, containers, all the things you need for the ongoing program. I did supervision for the vendors for planning, process and transporting. For the trip to Kakuma, I decided to go along with the drivers – I realized I needed to experience what that travel was like. I knew that it would be very challenging, and if I stayed behind, I wouldn’t understand what they faced on the road. I didn’t want to sit back in the office and not know. So I went along and experienced it. It was very difficult. It was very, very hot and the road was so bad that it took many hours to move along. I’m glad I went. Now I see. I feel like I’ve accomplished something. 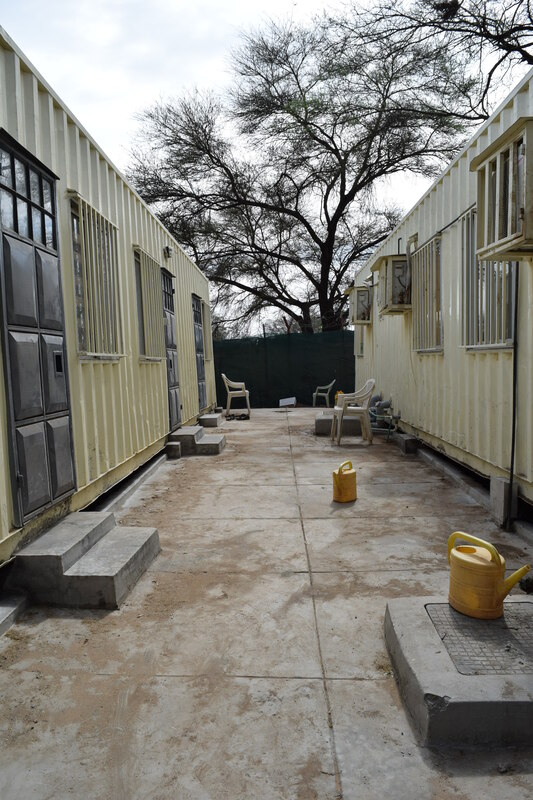 In addition, we hired a vendor that customized several shipping containers, refabricating them so they could be used for office and housing spaces in the camp. Getting the containers to Kakuma took a week on the road. They completed the construction to the interiors and then loaded beds, mattresses, physio items and supplies for the trip. They put them all on the transport – there were three 40-foot containers. The containers were in bad shape when they arrived at the camp because of the bad roads. When I say bad roads, I mean that the roads are not paved. There are deep ruts. They are often washed away – sometimes you’re driving and there is no real road at all. So because of this, there was a lot of damage to the containers. It was not a good idea to prefabricate them before transporting them to the camp. Because of the rough roads, ceiling pieces fell, the toilets moved or broke where they were installed, the walls cracked. So this was a lesson: next time, we will ship empty containers and modify them on site. So the supplier had to fix them; I negotiated a rate and set up new timelines and terms. We got them done and they went right into use. We try to make them as comfortable as possible for the staff; we set up electricity and water, get comfortable beds, do the landscaping. It’s very hot in the camp, so it’s important to focus on ways to help people be comfortable. They need a calm, clean place to come back to. I know what it’s like to work all day in the heat and come back to a room where you aren’t comfortable. We got it done. It’s times like that that I feel that this work is so fulfilling. And I always make sure I do it seamlessly. In my day-to-day work in Nairobi, I facilitate team movements to the office and clinics. I make sure staff get what they need, and I facilitate getting supplies to all the centers. I handle the fleet management, overseeing where all the vehicles are, where they are needed next, when they need service, insurance. Everything is very detailed. I keep it seamless for the workers and try to never have a gap in service. I have a really good boss with Pablo Traspas (country director, CVT Kenya), and he tells us we are doing a really good job. It’s fulfilling doing this work when all goes well and no one has called with issues. I like it when we have all closed cases. It’s a good feeling. That’s when I feel commitment: this is what I’ve done for CVT and I’m proud of it. CVT’s a great place to work. I enjoy it. And I appreciate the people who support CVT. Trust me. The impact on the ground is very important to our clients – I can tell it from their faces, they are having changes in their lives because of CVT.